My second favorite Craigslist purchase to date is my Pottery Barn Aris Pedestal Table. I bought it for $20! Yes, that's right TWENTY dollars. Its normally a $700 table! When I bought it, it was pretty scratched up, but for $20 well worth it and nothing a little sand paper and paint wouldn't fix. I apologize I don't have any before or progress pictures. I finished this project right before I started my blog. I sanded, primed, put a couple coats of bistro white paint on it and finished it with a clear coat of Minwax Polycrylic® Protective Finish in a satin finish. Oh and in case you are wondering what my all time favorite Craigslist purchase is, its my house. Gorgeous!! I'm getting ready to paint a foyer table. It's so much fun. now that is a deal...aren't you a luck girl? 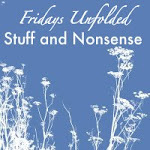 great find and awesome makeover...looks beautiful...thanks for linking up to fridays unfolded!